The below Discussion to Paper was submitted to ASCE - Journal of Engineering Mechanics on 3 February 2009 and approved for publication 3 June 2009, apparently awaiting a reply or Closure by Messrs. Bazant, Le, Greening and Benson, that had not come forward 15 December 2009. Messrs. Bazant, Le, Greening and Benson had presented a theory, where a small top part C of a structure from above compacts and crushes into dust a bigger bottom part A of same but stronger structure only due to gravity, and suggest that it explains the progressive collapses at free fall speed from top down of the WTC1/2 towers of NY on 911 2001. Mr. Anders Björkman, M.Sc, suggests that the Bazant & Co theory is terrorism supporting nonsense. The illustrations, figures 1-8 did not form part of the original submission to ASCE-JEM but are added here for easy verification of observations. As ASCE/JEM were delaying publication, I decided to publish it here, 15 December, 2009. Comments are always welcome at anders.bjorkman@wanadoo.fr . My paper was finally published by ASCE/JEM in July 2010. Introduction added 18 April 2010, after 15 000 downloads of this page between 14 and 18 April, 2010:. Terrorists and some other people, incl. 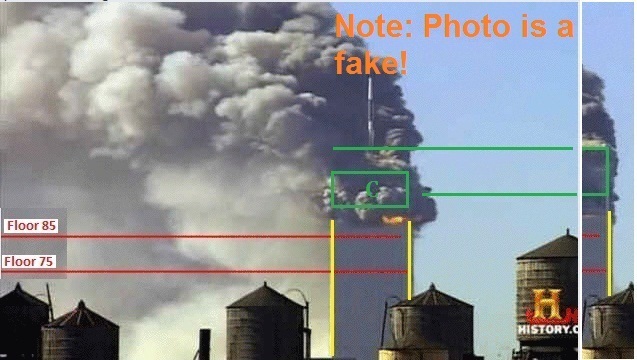 the US government, suggest that when a skyscraper like WTC 1 at NY is on fire up top as seen on below photo and on this video recording of the event from ABC and when plenty of smoke is ejected from the little top part, that the bottom part suddenly later goes POUFF, POUFF, POUFF 97 times, i.e. collapses (?) from top (!) down to ground (!) due to gravity ... and becomes dust! The ABC staff commenting doesn't know that you can fly as many planes into tops of skyscrapers as you like ... and the result will never be a structural collapse from top down! Nothing collapses structurally from top down. A structural collapse is always from bottom up as described in picture right. The ABC video is a fake. And no structure becomes dust while collapsing! Actually, the ABC video is a pre-fabricated, 100% falsification! It is a movie or video with animations of an alleged 'live' event on TV - Hollywood style - that doesn't take place in reality! It starts with a 'live' interview with plenty of cats and dogs popping in but later things get really serious - the 'crush-downs' of both WTC 1 and 2! By removing an element, e.g. a supporting pillar 'x', at the bottom of any structure the elements above are affected - they displace down - one after the other starting from bottom and developing upwards, i.e. the structural failure or global or local collapse is only possible from bottom to top. The load carried by 'x' is transmitted to adjacent elements. If you can describe a structure where removing 'x' at the top will destroy the complete structure below, please try to win my �1 million Challenge. A small, weak top part of any man made structure cannot destroy due to gravity a much bigger, stronger part below of same and stronger structure keeping it up in the first place. Especially not from above! And from above down! Anybody suggesting that a structure A can be destroyed by a small part C of A from above + gravity is a terrorist! You can win � 1.000.000:- proving me wrong! Just visit here. The Challenge has been open for many years ... and nobody, including terrorists like NIST or Bazant, has even tried to win it! The above photo of WTC 1 also shows another building (WTC7) that drops down at free fall speed on itself six hours later. Again terrorists and some people, incl. the US government, suggest that it also is normal, when a structure is affected by fire. Heiwa Co has debunked that theory a long time ago. Another photo (it is another fake done by Photoshop! 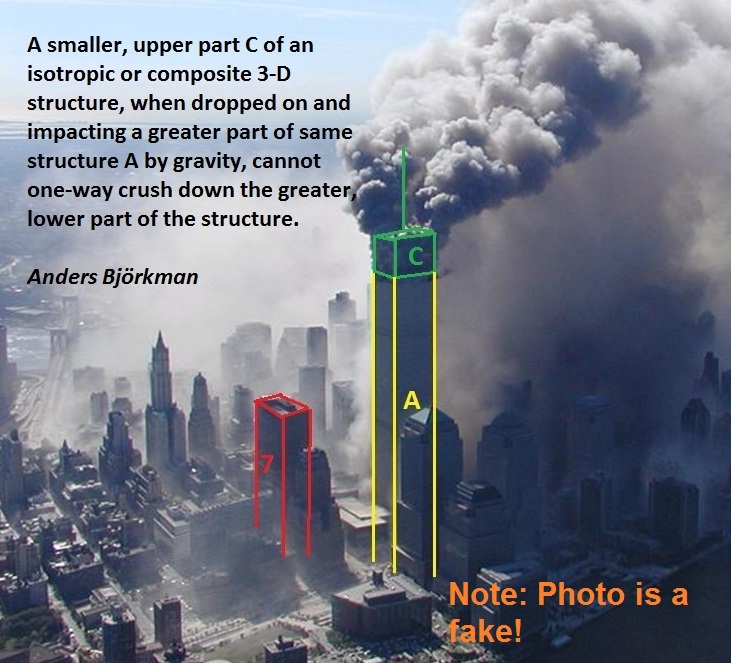 ), right, of the destruction of WTC1 behind WTC7 shows clearly that no small top part C of A is crushing A but that A is destroyed into plenty of dust using Photoshop from top down in a controlled way leaving bits and pieces temporarily behind and not as per the New York Times 'floor-by-floor' collapse below published 9/12/01 in NYT to terrorize the public! Imagine all NY skyscrapers collapsing 'floor by floor' due a column failing up top! According terrorists like Bazant & Co dust is only ejected from below the small top part C!! In reality the WTC towers were destroyed from bottom up, as it is the only way to destroy a skyscraper in 15 seconds. Footage of the real destruction (from bottom up) exists and will be published ... 2099! Fake photo of WTC1 progressive collapse with WTC7 looking on. No intact top part C crushes down intact bottom A. Photo shows as if the concrete floors become ... dust? Very strange! (Also as Power Point presentation + nice figures presented on 19 February 2010 to AE 911 at San Francisco - http://www.ae911truth.org/ . Support AE911truth.org and Richard Gage to get a new investigation done). BLGB suggests that upper part C (of WTC1) drops on the lower structure of WTC1 - part A - that is one-way crushed in 97 steps until ground. Fig. 1 - The Bazant & Co crush-down theory applied to a structure consisting of five assemblies of structural elements - one upper part C and four lower parts A; All parts consists 95% of air. Each part has height h. Thus total structure has height 5 h.
(1) Lower parts A carries upper part C of the structure statically with a FoS >1 (actually >3 so that part C will not collapse by itself before start). Primary load bearing elements make up <1% of the structure volume. Upper part C is then dropped on top part A and one way crush-down, suggested by Bazant & Co, starts. The suggested reason is that upper part C can apply sufficient energy and pressure to destroy elements in part A and compress them into rubble part B without destroying itself. It is of course crazy! 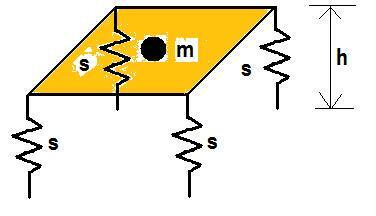 Part C cannot apply energy and pressure to destroy part A without destroying itself! (2) Upper part C has crushed down top part A into rubble part B A/4, while only air is ejected; The density of part B rubble is 4 times the density of C and A according Bazant. Part C has dropped 3/4 h. Part C remains intact according to Bazant & Co. In reality it cannot happen but Bazant & Co suggest otherwise! POUFF 1! (3) Upper part C and rubble part B have crushed down two top parts A into rubble part B A/2 and more air is ejected; Part C has dropped 1.5 h! The rubble B assists the crushing of part A. POUFF 2! (4) Upper part C and rubble part B have crushed down three top parts A into rubble part B 3A/4, etc; Part C has dropped 2.25 h. The rubble B assists the crushing of part A. POUFF 3! (5) Upper part C and rubble part B have crushed all four parts A into rubble part B = one part A, etc; Part C has dropped 3 h. The rubble B assists the crushing of part A. POUFF 4! (6) Rubble part B (!) has crushed up (?) upper part C into rubble from below. Parts A and C with density 0.25 have become 100% rubble of height 1.25 h and 'rubble' density 1. POUFF 5! (7) The rubble then spills out on the ground in a pile, according Bazant & Co (and is more compressed to density >1?). POUFF 6! However, the mast on the roof of WTC1 remains on top of the rubble pile! No POUFF could destroy the mast! 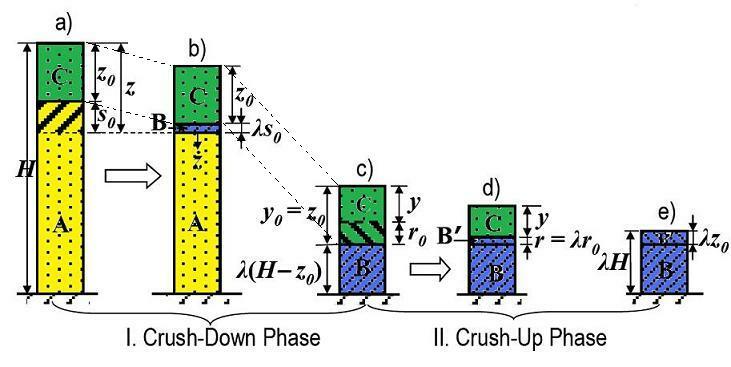 Steps 2 to 6 go very fast according to Bazant & Co; Upper part C decends down/crushes parts A and produces rubble part B at acceleration about 0.7 g (g = 9.8 m/s²). If the structure A+C is only 1 meter high (and the top part C 0.2 meter), 0.8 meter A should become 0.2 m rubble B in a fraction of second like a POUFF! What kind of magic structure or material is that? The Bazant theory can evidently not be verified in a laboratory or in reality for any structure of any size. Actually the whole theory is complete fantasy to support US terrorism: Upper, structural part C would either bounce or get locally damaged (partly or completely) when contacting and putting pressure on structural top part A after a gravity drop and would then get stuck up on top of parts A. No structure of any size and kind can be crushed by an upper part of itself from top down by gravity. It is quite elementary! Part C and the rubble part B cannot ever apply sufficient force/pressure/energy to crush part A from above. It is quite easy to calculate the pressure applied and energy released by falling upper part C and any rubble B and compare it with the energy required to break all elements in part A. The pressure applied and energy released by C and B is too small ... and difficult to apply on A ... so A will never be crushed down. Question remains why Bazant & Co suggest the opposite? It is insane! Are Bazant & Co part of the conspiracy to destroy the WTC at NY? Fig. 2 - Figure 2 bottom from . The suggestion by Bazant & Co that a small upper top part C of any structure can crush down a bigger same structure bottom part A into rubble, part B, only by gravity is not possible. Upper top part C can never apply sufficient force and energy on the bottom part A and the result should always be that upper top part C remains stuck up top. The Bazant theory can not be verified in a laboratory for any structure. 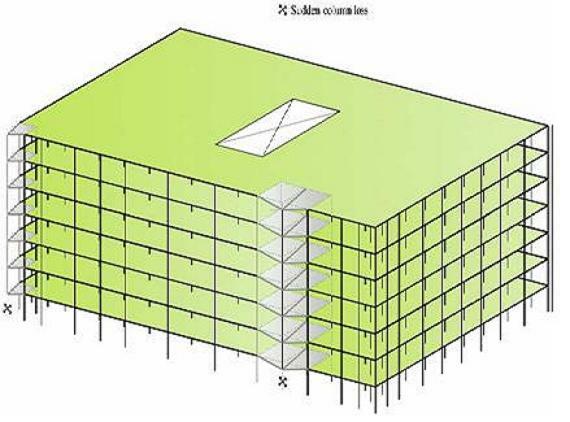 During crush of the first, the uppermost storey of part A (floor 97) a layer of debris is formed - part B - that grows thicker as more storeys are crushed by parts B and C. What happens using the BLGB model is easily calculated by simple calculations, step by step. Differential equations are not really required. Fig. 3 - Upper part C prior "crush down". It is 53 meters high. Floor levels 85 and 75 of Lower part A are indicated in red. Warning - photo is a fake, i.e does not show a real collapse! 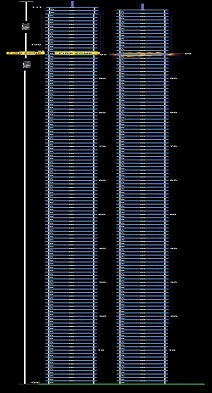 Near the top, the specific mass (of WTC 1) (mass per unit height) µ = 1.020.000 kg/m or 1.020 ton/m according BLGB. With a storey height of 3.6 m, the mass of a storey is thus 3.672 ton. Assuming the upper part C is 53 m high (14.7 storeys) as suggested by BLGB, total mass of part C above the initiation zone for collapse is 54.060 tons. Part C is supposed to drop down and to one-way crush all 97 storeys of part A, while part C only suffers 'negligible damages'. Part A is quite similar structural wise to part C even if the columns get stronger lower down. Using a floor area of 4 000 m² the volume of part C is 212 000 m3, thus the uniform (which it is not) density of the upper part C is 0.255 ton/m3 or 255 kg/m3 according BLGB. It is not very much. Reason is that there is plenty of air inside a storey structure. BLGB assumes that the upper part C has some sort of homogeneous structure/density. The known typical (sic) density (sic) of rubble, µc = 4 100 000 kg/m or 4 100 ton/m according BLGB. The density of this rubble is then exactly 1 025 kg/m3 (as the floor area is 4 000 m²), which is the density of salt water (that ships float in). Thus, when one typical storey structure of WTC 1 part A is homogeneously crushed according the BLGB model, it becomes 0.896 m high/thick. As it was originally 3.6 m high, it has been compressed 75.1%. According BLGB, at initiation - part C - 54 060 tons (actually the lowest floor 98 of part C) - crushes the uppermost storey of part A - floor 97 of the lower structure of WTC 1 and compresses it into a 0.896 m thick layer of debris/rubble that becomes part B. Air/smoke is ejected sideways. BLGB suggests that the local failures are generally buckling of columns between floors 96/98 requiring little energy. Energy to compress the rubble is not considered by BLGB. This layer, part B, is then resting on the second uppermost floor of part A - floor 96. This compression takes place at increasing velocity of part C. Only air is ejected sideways out. The mass of the rubble - 3 670 tons - is uniformly distributed on the floor below - 918 kg/m² - and the floor should be able to carry that uniform load according general building standards. What about the part C and its mass 54 060 tons? Is it acting on the debris layer part B? Not really - part C is intact according BLGB but only its bottom floor is now in contact with part B. The columns of part C are now not in contact with the columns of part A below due to the layer of rubble, but it must be assumed that part C columns contact the columns of part A below as suggested by BLGB, so that crush-down destruction can continue. The roof line of part C has now dropped 2.704 m after first crush (i.e. storey height 3.6 m minus part B height 0.896 m). Fig. 4 - Upper part C just after initiation of "crush down" and when roof line has dropped about 35 meters and the mast (sic) is still upright. There is no sign of a Part B - Rubble/debris below the Upper part C. You can actually see faked ejections of debris through windows at floor #85 and, on other videos/photos, local destructions of other kind here and here higher up. 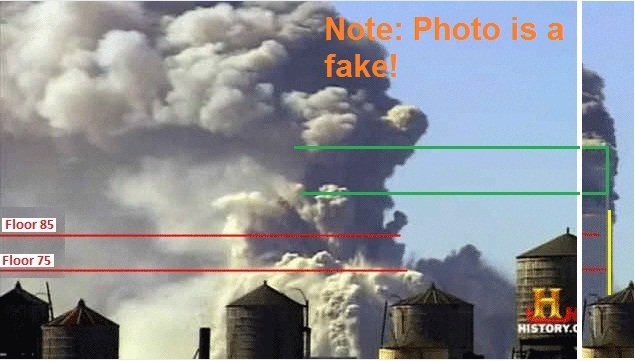 All photos and videos are simple fakes, i.e do not show a real collapse!! They are just copies from Hollywood style animation movies! No skyscraper 'collapses' from top down. Then the part C + part B (the layer of rubble/debris) crush the second uppermost floor (no 96) of part A and compresses it into another 0.896 m thick layer of debris that is added to part B. Part B is thus 1.792 m high or thick after two storeys of part A have been crushed. The part C columns now crush the columns of part A again (how?) so that the destruction can continue. The roof line has then dropped 5.408 m after two crushes! The velocity is increasing. More air/smoke is ejected sideways but only from the storey being crushed. Both the first and second crush is strange in many ways. You would expect the columns in part C between floors 97/99 to fail first at impact. The part C columns are weaker than the part A columns below. According to paper The Missing Jolt: A Simple Refutation of the NIST-Bazant Collapse Hypothesis  by Graeme MacQueen, Tony Szamboti, January, 2009 (http://journalof911studies.com/volume/2008/TheMissingJolt4.pdf ) and careful observations of videos of the alleged crush-down we now know that the roof line of part C dropped (displaced downwards) 35 m in 3.17 seconds at increasing velocity. This 'drop' of part C is also verified by BLGB. However, it is not part C moving down we see. It is part C becoming shorter, while part A remains intact. Every time a storey is crushed, part C drops 2.704 m and an 0.896 m layer of debris is formed according BLGB, and the part C columns also destroy the columns below - how is not clear as there is a thick layer of rubble - part B in between. Thus, when the roof line has dropped 35 m, 12.94 storeys, total height 46.6 m (!) of part A have been crushed and have been replaced by an 11.56 m thick layer of debris - part B. 46.6 m of columns of part A have been crushed at perimeter and core, the latter being mixed in the debris. I assume the wall columns are dropping down to ground outside the building. MacQueen & Szamboti believe that only 9 (or 9.72) storeys of part A have been crushed after 3.17 seconds, but according BLGB it should be 12.94 storeys. MacQueen & Szamboti forget that there should be an 11.56 m thick layer of debris on part A and below the upper part C, when its roof line has dropped 35 m.
Regardless - does anybody see an 11.56 m thick layer of debris - part B - on any video of WTC1 destruction after a 35 m drop of the upper part of WTC1, part C according BLGB? Or that 46.6 m of wall columns have disappeared? And does anybody believe that an upper part C with density 255 kg/m3 can produce an 11.56 m thick layer of rubble/debris in 3.17 seconds? Only BLGB suggests so, but there is no evidence for it. Reason is that BLGB ignore the energy required to compress the rubble. Simple calculations show that this energy doesn't exist. This layer of debris is then moving at a velocity of >20 m/s and increasing. The acceleration of parts C and B become rather uniform 0.65-0.7g, i.e. very little force is applied on part A. Only air/smoke should be ejected from the next storey below being crushed, where more debris is formed. Fig. 6 - "Crush down" between floors 85 and 75. Upper Part C, crushing down anything, is evidently not visible in this stupid, faked animation or whatever it can be, nor is Part B - Rubble/debris. 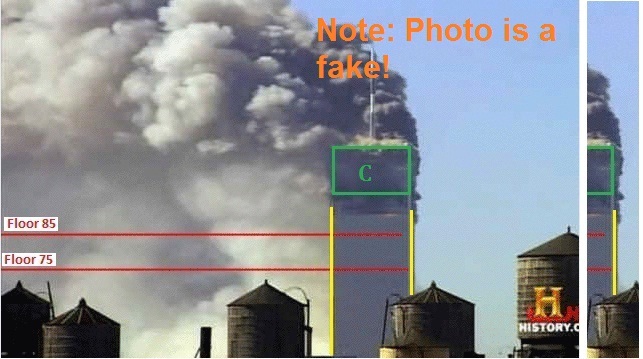 It should be clear to everybody that the WTC 1 in the photo is now blown apart by energy released inside the tower as described here. In reality WTC was probably destroyed from bottom up. Now - when part C has dropped 100 m and 37 storeys (floors 97-60) have been crushed, the layer of debris - part B - should be 33 m thick on top of which a 53 m high part C should be visible (forgetting the mast). 133 m of walls should be missing! You do not need differential equations to calculate this. Simple math suffices. And when part C has dropped 200 m and 74 (floors 97-23) storeys of WTC1 have been crushed, the layer of debris should be an impressive 66 m thick with part C still riding on top of it. Imagine a layer of debris - density 1 025 kg/m3 - 66 m high. Over 4 000 m² floor area it is almost a big cube of 264.000 tons of rubble. On top of which part C - 54 060 tons floats. Part C is 53 m high. Fig. 7 - "Crush down" below floor 75. Upper Part C is evidently not visible, nor is Part B - Rubble/debris. Smoke is ejected upwards indicating energy release other than that of gravity. However, the photo is 100% faked! It must be just an animation. No skyscraper can crush itself from top or be blow apart from inside starting from top! The top Upper Part C is much too light and weak to destroy anything below and seems to be the first part to disappear. Add the rubble - part B - and we have a moving mass that is 119 m high, when the part C roof line has dropped 200 meters. Below this 119 m high pile, a storey of part A - floor 23 - is just being crushed. How the columns of part C - 66 m above floor 23 - can crush the columns there is not clear. 266 m of walls should also be gone. There are another 23 storeys still to crush. About 83 m of WTC 1 remains to be crushed. Can it be seen on any video? Note also that upper part C is still accelerating at 0.7g at this time. The speed is of the order 45 m/s. 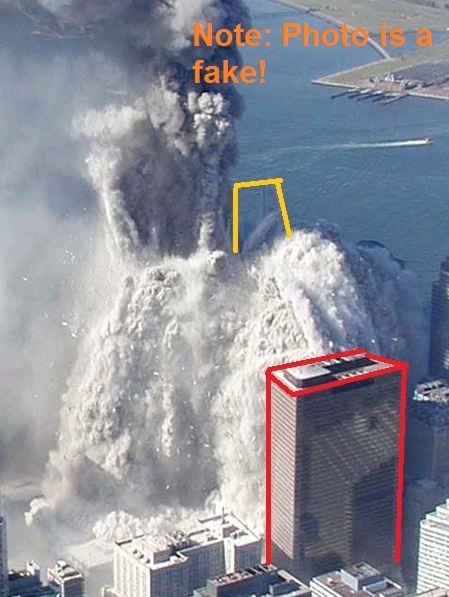 When all 97 floors of WTC 1 - part A - have been crushed, there should be an 83 m thick layer of debris on the ground + upper part C on top of it - 53 m.
This is also confirmed by BLGB - see fig. 3 (b) in their paper: just before the end of crush- down the 53 m high part C rests on a 92 m thick layer of debris (density 1.025 ton/m3) - the crush down has also penetrated the basement 22 m below ground! The roof line of part C should be 133 m above ground then. An instant later upper part C is destroyed in a crush-up according BLGB and should form another 13 m thick layer of rubble (according another differential equation). The total thickness of rubble should be 92 + 13 = 105 m minus 22 m of rubble in the basement = 83 m of rubble above ground but only 20 m is suggested by BLGB. Evidently some rubble is spread outside the 4 000 m² foot print, but it seems the density of the rubble must have increased 3 times - 3.075 ton/m3. But it is not possible - it is too dense. So where did all the rubble go? Actually no rubble could be produced at all by dropping upper part C, as the destruction should have been stopped up top due to all local failures developing, when part C contacts part A and friction between all partly damaged parts develops at floor 98 level. Only by ignoring local failures and friction at first contact between parts C and A, the BLGB model is initiated. If any further columns would fail, they would have been in part C.
But what the BLGB theory and model postulate cannot be seen on any videos of the WTC1 destruction. 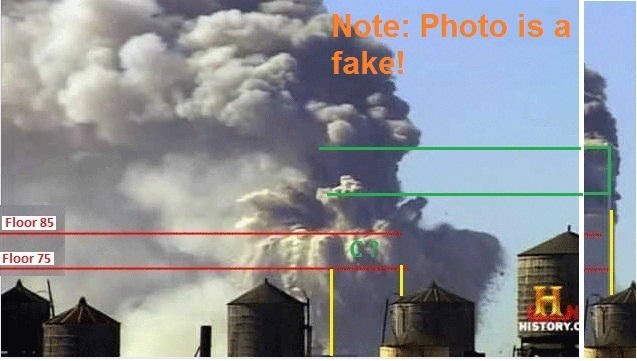 Simple observations of any video of the WTC1 destruction prove the BLGB model wrong. (According Bazant: "The compacted layer cannot be expected to be seen in the video record. Similar to construction demolitions, it is not, and cannot be, located just under the upper margin of the cloud because the rapidly ejected air and dust spreads both downward and upward [Fig. 3(a) in the paper]"). 20 June 2010 - Bazant & Co has replied to above! Try to crush a structure from top down! This is a very funny element! What can it be used for?